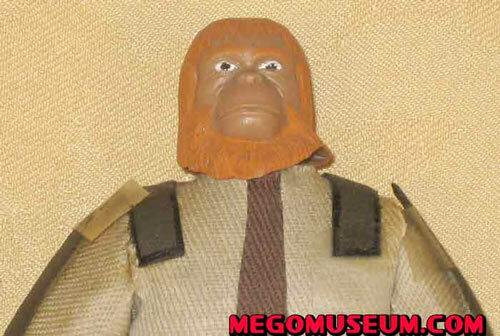 Mego sculptors did a wonderful job of capturing the likeness of Zaius. 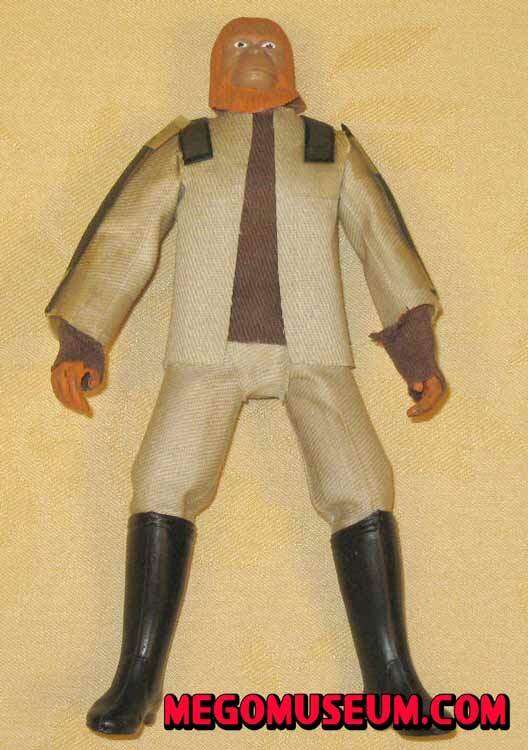 His beige outfit includes knee-pants and a jacket, with vertical strips of brown fabric representing the leather glyphics of the originals, and fake fur cuffs. 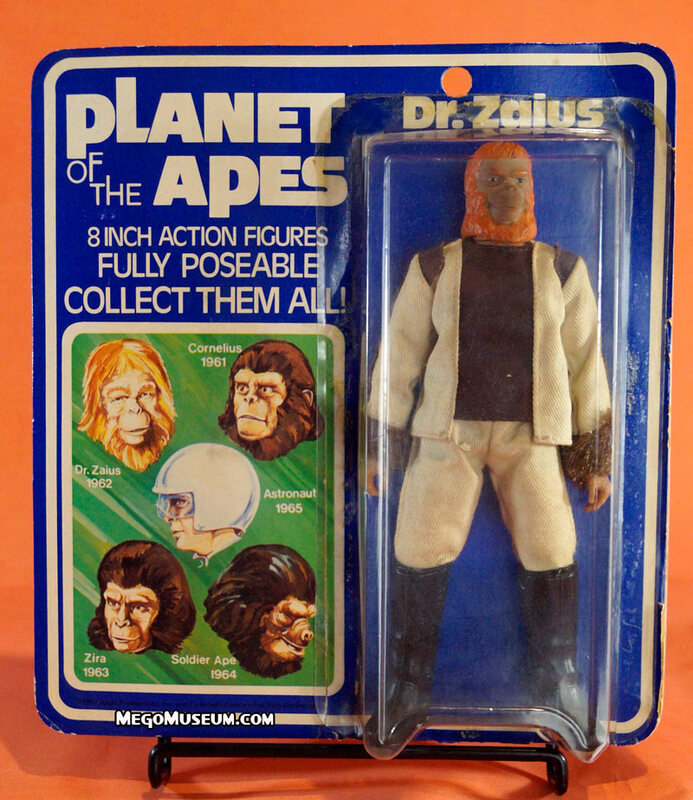 An orange outfit would have been more accurate, but Mego fans should be thankful they didn’t get Dr. Zaius in blue, as he was depicted in dozens of other toy lines. 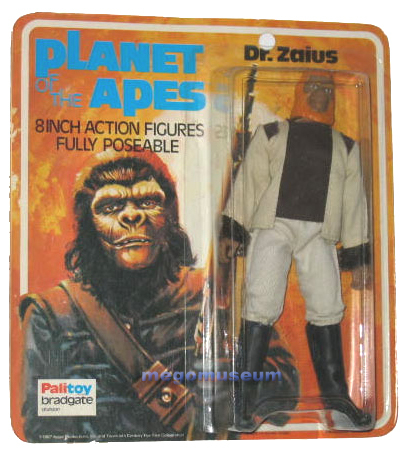 Dr. Zaius came in the coolest of ALL Ape boots: Very tall and made in black plastic, these boots had fantastic “Glyphics” molded into the upper sides. 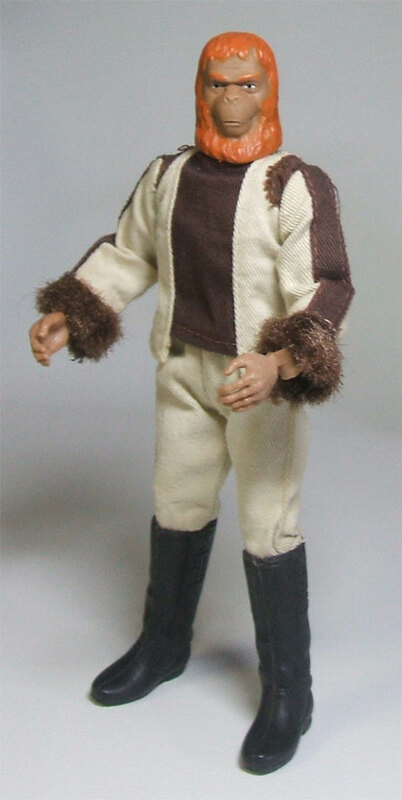 These boots were unique to Zaius, and never used for any other figure. Very first issue figures, however, were packaged with a simpler black hero boot (available with the fishing outfit for Action Jackson). He was available on a type1 and type 2 body although type 1 is much more common. 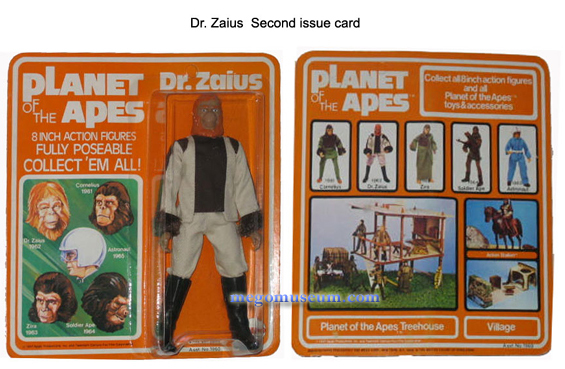 The only really significant variation found on Dr. Zaius is hair color, which could range from yellow to orange. second issue (See the Cornelius page for exact size comparison). the body type will vary however. Quest for Toys. EL PLANETA DE SIMIOS!! 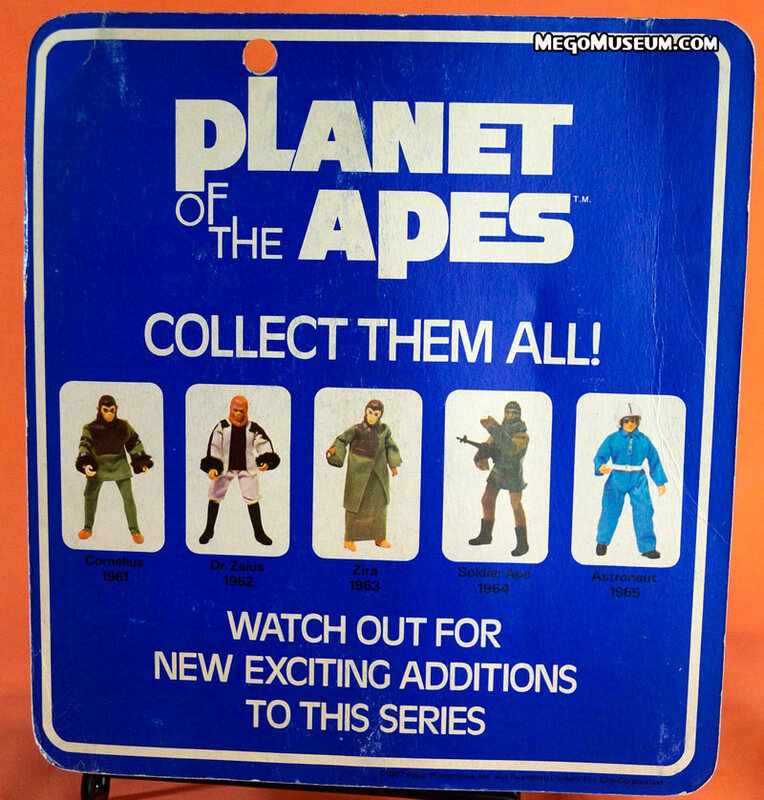 Much like the Star Trek line, Palitoy Bradgate initially released the first wave of Planet of the Apes on cards that were variations of the Mego US Cards. The major changes are obviously the card is blue instead of Orange and the back promises no playsets or accessories, just the basic assortment of figures. When Mego first proposed the Planet of the Apes license, the R and D department created early mock-ups to visualize the concept. While this is common in the toy industry and occasionally you can see such mock ups in toy promotional materials, they rarely physically surface themselves. This is mostly because they were simply tossed out after production begins. Thanks to the foresight of a then junior Mego employee we can see the crude yet charming first attempts at the line, 35 years after creation. 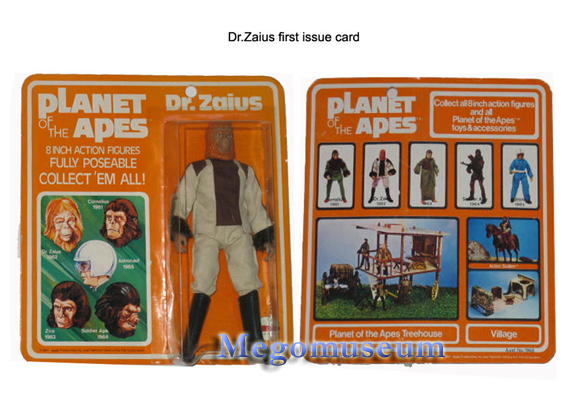 This early Dr. Zaius has an outfit made of denim with leather patches sewn on, it’s actually quite close to the end product. The boots are from the Action Jackson Fishing adventure set. 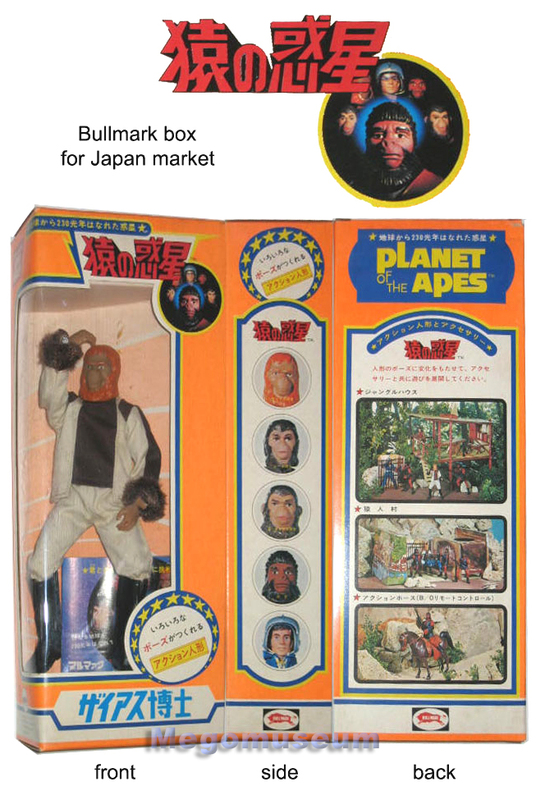 The Dr. Zaius body is merely a type one Action Jackson with it’s hands crudely painted orange, to our knowledge these figures only appeared in print once, in Famous Monsters of Filmland Magazine. The only finished figure appears to be the Astronaut which lends creedance to the theory that his head sculpt from another project. 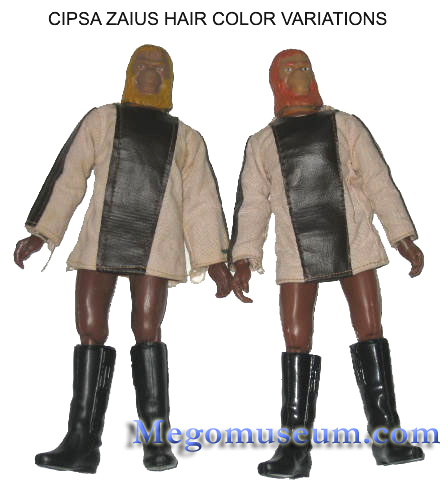 Zaius is found with two styles of boots. More common (and much cooler) are the glyphic boots. 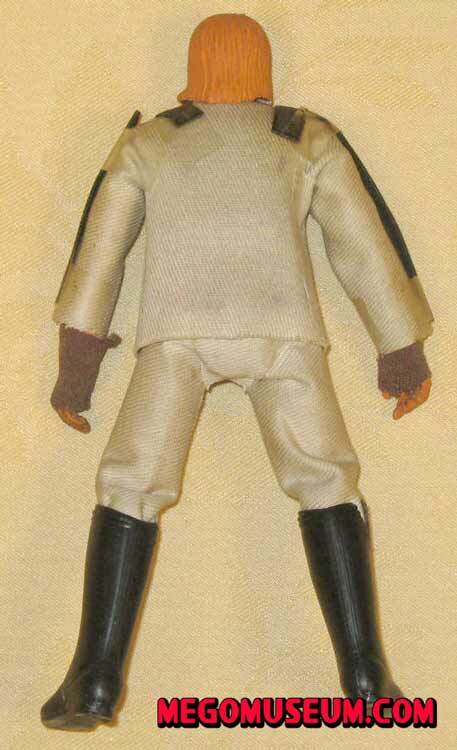 Glyphic boots can also be found on the Ledy version of the Apes line. The Ledy version boots have a more glossy finish than the U.S. version. 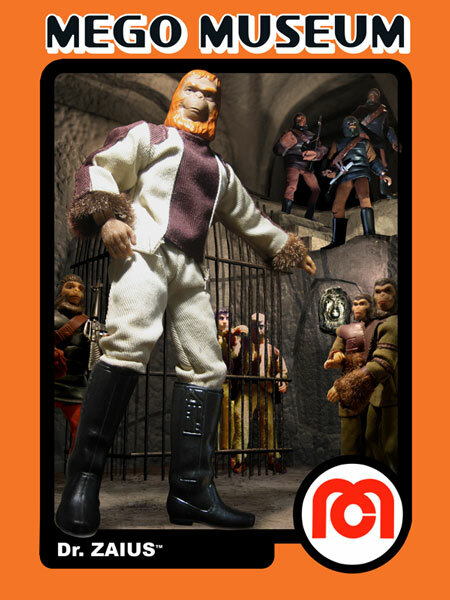 The glyphic boots have been factory reproduced produced by EMCE Toys on their reproduction Dr. Zaius figure. The EMCE boots have a higher gloss finish, making them look more like orignial Ledy boots. They are a little thicker plastic, so more firm. The size and shape are exactly like originals, but the details on the glyphic part are a little finer, and more sharp. The EMCE boots are unmarked. 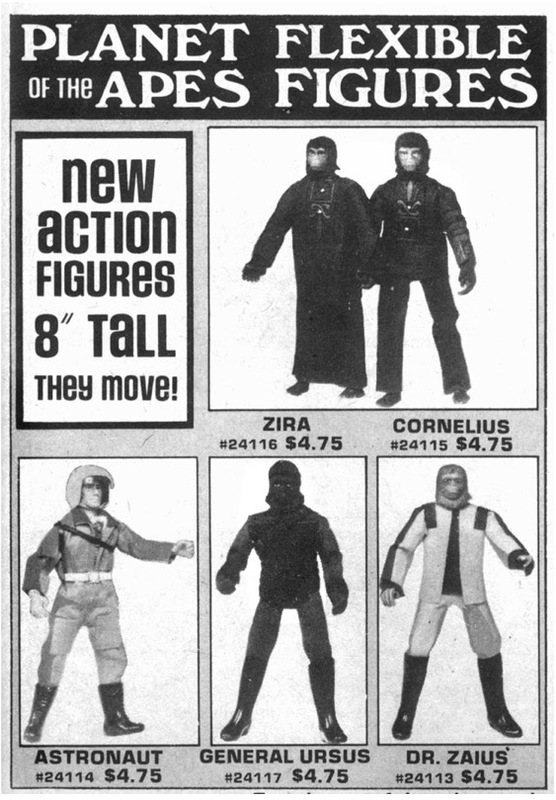 Less often, Zauis can be found wearing black hero style boots which are also found in the Action Jackson fishing set, but it should be noted that the AJ sets boots are shaped like the hero “skinny” boot, while the Zaius version was the wider, more common hero style. 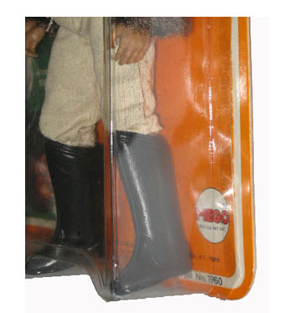 Both Doctor Mego and Classic TV Toys have made reproducitons of the hero style boots. Both reproductions are more glossy than originals. DM’s are a thicker plastic, more round around the edges and stamped DM on the bottom. CTVT’s are closer in thickness but are slightly different in shape. They are unmarked. Zaius sports an off white coat with brown trim and brown fur cuffs. The coat has been reproduced by EMCE Toys. The reproduction is almost exact in every detail to the original. Very minor exceptions. The fur on the cuffs is a little longer and bushier. The brown strips along the shoulders are a little wider on the reproduction and the snaps used to fasten it are a size bigger on the EMCE. The material is pretty much a dead match. Perhaps the whites are a little brighter, but that could vary from original figure to original figure due to age, fading, etc… The reproduction is unmarked. 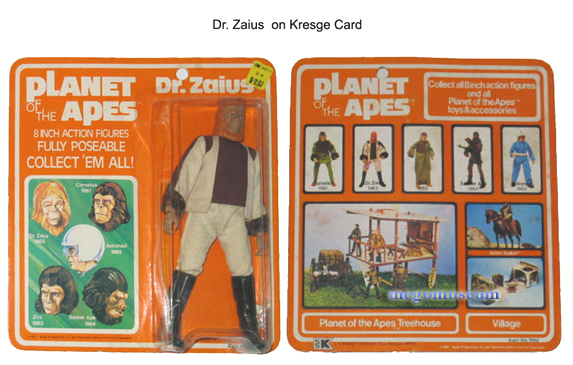 Zaius wears knickers! Knee length pants that aren’t meant to tuck in his boots, that is. 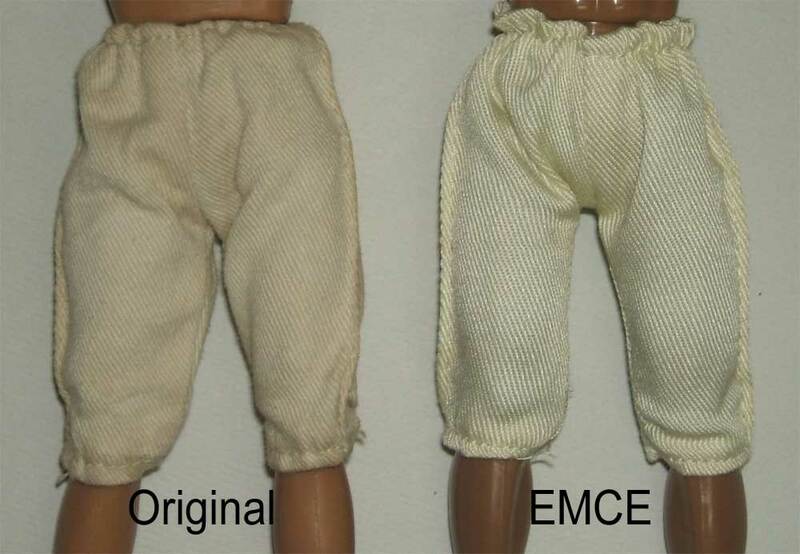 These have been reproduced by EMCE toys. The reproductions are made of an almost exact material. The biggest difference is at the waistband. The EMCE’s are sewn more bunched up and tighter about the waist. They also fit a little more snug overall. The reproduction version is unmarked. 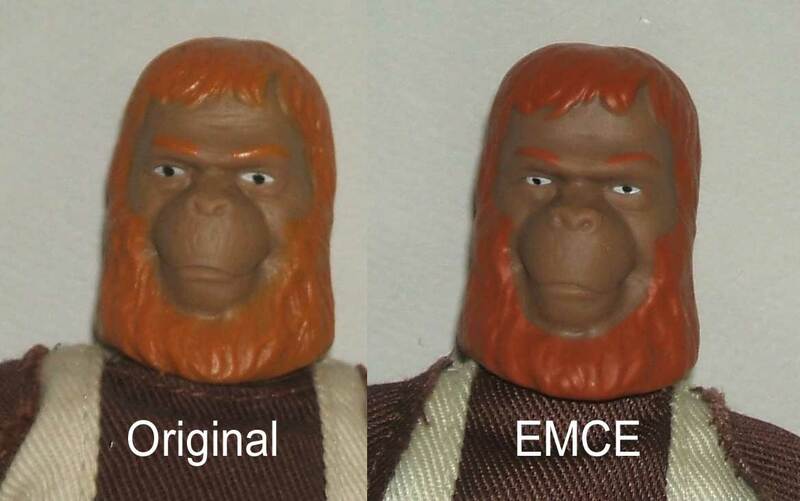 The Zaius head has been factory reproduced by EMCE Toys. The vinyl head is very similar in material on both. The shape is a little different. The reproduction is bigger, nose to back of the head, but more narrow from ear to ear. The details on the reproduction are a little softer, and the paints are a touch different, especially around the eyes and eyebrows. The skin tone is darker on the reproduction, as is the orange hair color. 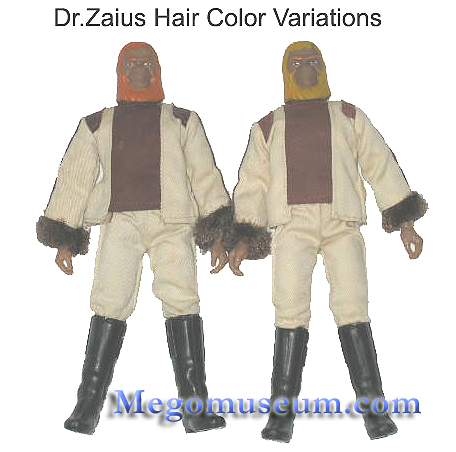 However, Zaius hair can color slightly with age, so it’s hard to say for sure that the reproduction hair is darker than all original figures. The reproduction is stamped with a 1968, 2008 Fox copyright on the back of the head.